If you love riding in the rain, you’re part of a distinct minority. Still, unless you’re facing a truly serious storm, there’s no reason to stay inside just because there’s a little water on the road. Here are some safety tips for riding in the rain so you can handle the challenges of bad weather like a pro. Leave extra room between you and whoever is in front of you. Wet streets mean longer braking distances, and you’ll also need to modify your braking technique. Use both brakes in wet conditions, but use less pressure on the front brake than you usually do under dry conditions. Rely more on your rear brake. 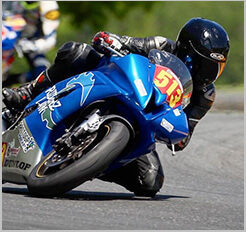 Sliding with the front wheel usually means wiping out, but sliding with the rear wheel is usually correctable. Don’t slam down on your brakes; it’s never a great idea to stop short, but in wet conditions that’s much more dangerous. Smooth, controlled movements and easing into a stop keep you from locking up the front wheel when the tires and roads are wet. Gripping that front brake hard on a wet road almost always means hitting the pavement. Wear good rain gear, Gore-Tex if possible, or something equivalent. You should aim for fabric that is waterproof, yet breathable. Choose high visibility clothing all the time, but especially when it’s raining, because the weather will make it even harder for car drivers to see you. Keep your face covered, ideally with a full face helmet, because speeds above 30 mph in the rain cause those droplets to hurt your face. Use Rain-X or something similar on your visor to improve your visibility. You should already be braking more cautiously, but when it comes to cornering, give yourself more distance so you have a chance to slow down. Brake well before you go into the corners, and turn deliberately. Remember, all of that traction that keeps you going on dry land is mostly gone in the rain, so don’t ride aggressively. Yeah, always watch the road, but pay extra attention to a rain-soaked road. Painted lines can freeze easily and are very slick when wet. Manhole covers are now a hazard. Avoid puddles, because you just can’t tell in advance how deep they are. When you see rainbows, realize they’re oil on the road and you need to avoid those areas. Roads are slipperiest within the first hour or two of a rain since that’s when the water mixes with all of the oil on the road, so if you can, wait for a few hours to go. Check your tires every time you ride, but if you slack on this, don’t skip it in the rain. If they’re too worn or not inflated enough, you can end your ride fast, in the hospital. Big, fat rear tires can hydroplane easily; if you start to fishtail, stay calm and don’t make any sudden moves with your direction or braking. Instead, calmly ride it off as you back off the throttle. If you keep calm and relaxed, you probably won’t have any trouble on a rainy road. 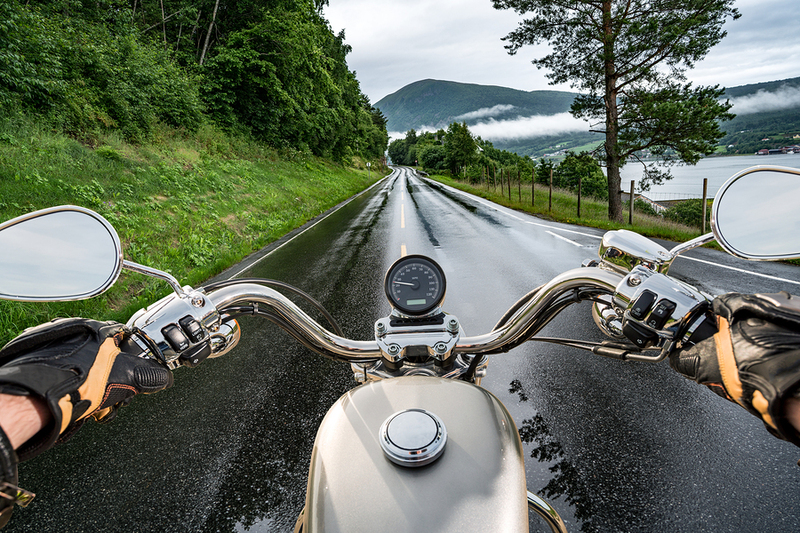 Just keep these safety tips for riding in the rain in mind. And remember, if there is lighting, flash flooding, or a serious storm, you should not be riding.